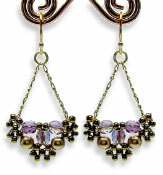 Earbobs: the perfect name for these vintage-look darlings. So fun to stitch I bet you&apos;ll make several in different colors for yourself and for gifts. 4 lengths of chain, 3/4-inch ea.